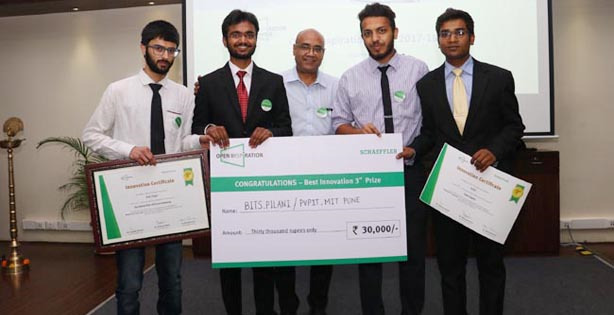 BITS Pilani Student Animesh Jain and his teammate Satyam Bhaskar have secured the second runners-up position in Schaeffler India 'Open Inspiration' Challenge and awarded with Rs. 30,000 for showcasing the basic prototype and concept of "Automated Bike with Gyroscopic Balancing,” a bike that self-balances and is fully automated. Open Inspiration is a platform for design thinkers, inventors and researchers to showcase their innovative ideas and products focused on developing sustainable solutions for a better tomorrow. Schaeffler India, a leading industrial and automotive supplier, announced the ‘Open Inspiration India’ program last year, visiting 26 colleges across India over the past few months, involving 300 students and gathering a total of 114 entries for the event.15 finalists were shortlisted from multiple colleges across India who were judged by an eminent jury consisting of Dr Alfred Rivinius, CTO Europe-Schaeffler Group, Mr Michael Schlotter, Innovation Head-Schaeffler Group, Biswa Mandal – Head of Technology, Schaeffler India, Devkumar Davesar – VP, Industrial OEM, Prof.Prakash Ramchandra Apte of IIT Mumbai, Dr Jayant Khandare, co-founder and Chief Scientific Officer, Actorius Innovations and Research and Dr Amit Dixit, CTO, Sedemac Mechatronics. Students from leading institutes like BITS Pilani, Maharashtra Institute of Technology Pune, SRM Institute of Science & Tech Chennai, Army Institute of Technology Pune, Netaji Subhas Institute of Technology Delhi, Birla Institute of Technology Patna, PVPIT Pune, MITCOE Pune, VIT Pune, Vellore Institute of Technology were shortlisted to showcase their ideas at this platform. With focus on ‘Inter-Urban mobility’, ‘Eco-friendly drives’, ‘Energy Chain’, ‘ Production Technologies’, ‘Digitalisation and IoT’, the projects submitted included an automated 2-wheeler, a Vertical Axis Water Turbine, a modified wheel hub for tractor and off-road vehicles, a simple-to-manufacture Hot Air Engine amongst others. The award was presented by Dr Alfred Rivinius, CTO Europe – Schaeffler. Schaeffler India will provide mentorship, guidance and support to the four winning teams.